This spotlight has an incredible amount of very good white light to make navigating on the water or offroad safer and easier . The high quality lens projects clear white light with no dead or hotspots which is excellent for rainy or fog weather! 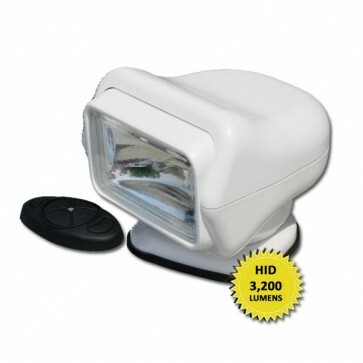 HID globes last longer than halogen globes ,draw less current and your batteries last longer. This HID spotlight can be controlled by a wireless remote and the hard stop feature is great to get your light to stop easily in the desired position.